The Best Ideas 2016 conference is today and I will be the first speaker in line (11:30 CET), presenting one of my most favourite ideas: Judges Scientific. they offer a wide range of high quality speakers presenting their ideas. Speakers range from very well-known guys like Howard Marks, Tom Russo or Guy Spier to often quite good younger portfolio managers who run smaller investment partnerships. The ideas presented go across all investment styles, market caps and regions. are affordable and environmentally friendly, as one doesn’t have to travel, book hotels etc. you typically get more out of it. At real life conferences I often find it hard to keep concentrated after a couple of hours of pitching. I typically end up just writing down very rough points and looking up the idea myself when I am back home. The only drawback is obviously the networking component. In this regard, live conferences obviously have more to offer. My personal favorites are VALUEx, Trani and our group of German speaking value investors who meet in Omaha before the Berkshire AGM. 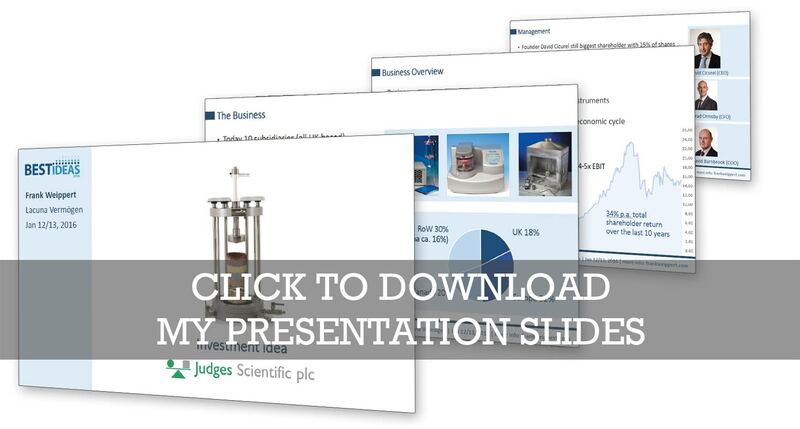 Judges Scientific is a London based acquirer of small niche market players that manufacture scientific instruments. The company fits into my “owner-run compounder” bucket and scores extremely well in both categories. It has an excellent founder manager who is not only a good operator and capital allocator, but also a person I fully trust. It has excellent compounding abilities: Over the last 10 years the company grew revenue by > 30% (> 20% per share) through a mix of organic growth at a very high return on tangible capital and M&A at cheap multiples. For details please watch the video.